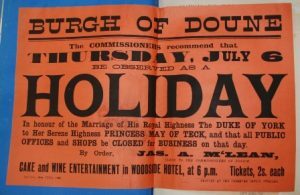 With the wedding of Prince Harry and Meghan Markle taking place on 19th May, our document of the month focuses on another royal wedding that happened over 100 years ago. On 6th July 1893 the royal wedding of Prince George, Duke of York, and Princess Mary of Teck took place at St James’s Place, London. Contained within a ‘press cuttings and advertisement book’ for Doune Burgh is a public notice for this wedding. It states that 6th July is to be a public holiday and ‘all public offices and shops will be closed for business on that day’. The town was also going to have cake, wine and entertainment in the Woodside Hotel at 6pm with tickets available for 2 shillings each. Before she married Prince George, Mary of Teck had been engaged to Prince Albert Victor, Duke of Clarence and Avendale. He was George’s eldest brother but died in January 1892 of influenza. Queen Victoria, however, was fond of Mary of Teck and still saw her as suitable candidate to marry a king. Additional public notices contained within the volume highlight other significant royal events. 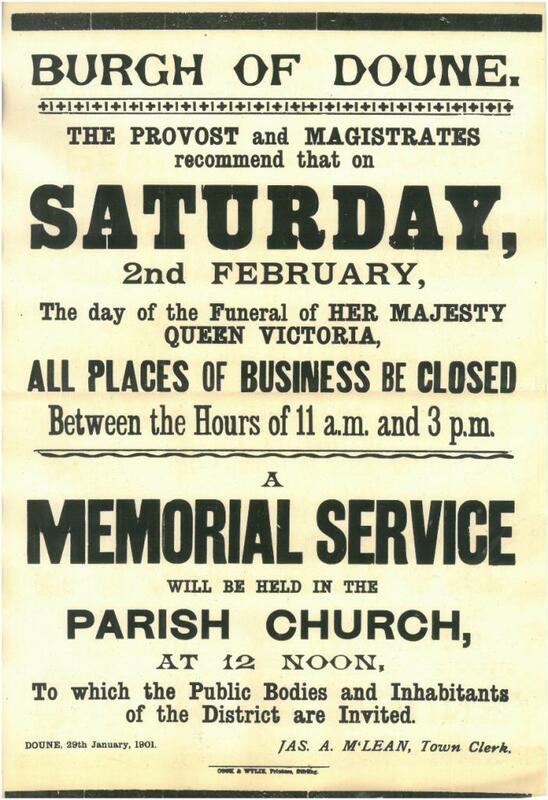 One was issued for Queen Victoria’s birthday in 1894 and another for her funeral on 2nd February 1901. 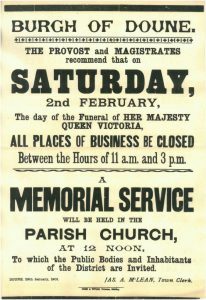 This notice stated that a memorial service was to be held at the Parish Church at 12pm and that ‘all places of business be closed between the hours of 11am and 3pm’. Next in line to throne was Queen Victoria’s son Edward. 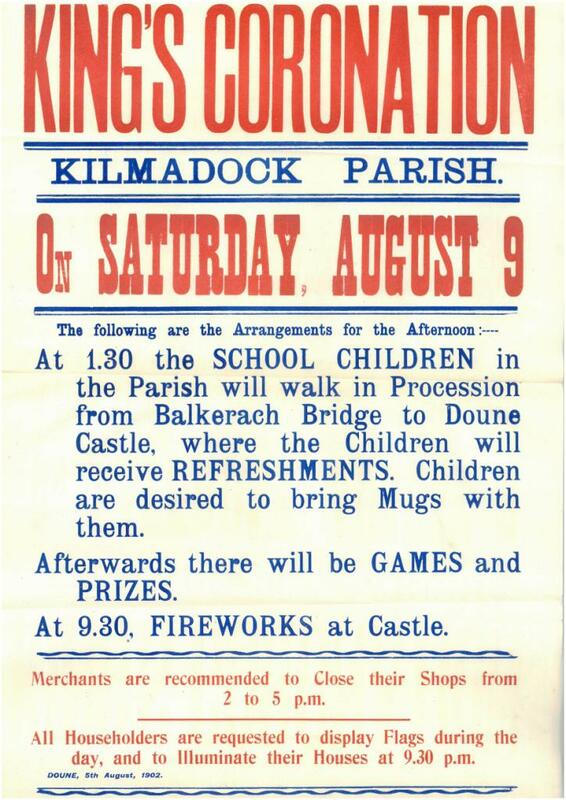 His coronation took place on 9th August 1902 and a public notice was issued to inhabitants of Kilmadock Parish. 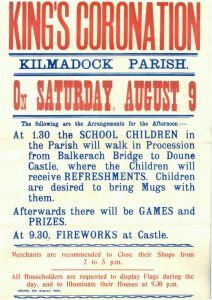 Celebrations in the parish were to include a procession of school children from Balkerach Bridge to Doune Castle and an evening fireworks display at the Castle. Shops were to be closed from 2pm-5pm and householders were encouraged to display flags and illuminate their houses at 9.30pm.